We get our eggs from our neighbor who raises chickens. We just put an egg crate in the mailbox and when we pick up the mail the next day we have a dozen fresh eggs. While making French toast one morning I grabbed an egg with a membrane so tough I could hardly break through. This incident took me back to sixth grade. I was visiting my grandparents. They had a subscription to, and a pile of, Popular Science and I loved to read them. I happened upon a story about making rubber eggs. It sounded simple so I asked my grandmother for an egg and a cup of vinegar. 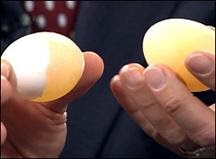 If you let the egg soak for a few days the vinegar (acetic acid) dissolves the calcium carbonate in the eggshell. Once the egg shell dissolves you end up with just the protective membrane. Sure enough, the next day I had a perfect rubber egg. Not satisfied with this egg oddity, and perhaps with too much time on my hands, I decide to experiment further with my egg. I asked my grandmother for some red food coloring. I put a few drops into the vinegar, curious to see if the vinegar was penetrating the egg membrane. I had my answer the following morning. I removed the egg from the jar full of vinegar and had a beautiful red rubber egg. The jar my grandmother had given me to perform my experiment happened to be an olive jar. After dumping the vinegar and filling the jar with fresh water, my egg was suspended in the jar like the small planet Mars floating in space. The following Monday I took my rubber egg to school to show my friends. It caught the eye of my teacher. She obviously had never seen anything like it. I could tell by the excited curiosity in her voice. Because of the sudden stir my oddity was causing my Irish Blarney must have kicked in automatically. When the teacher, surrounded by my classmates asked what it was I told them it was a Mexican Olive. Before I could explain that I was just kidding, the teacher said, "I am going to get the Principle, she needs to see this." Soon the Principle and several other teachers and staff members where at my desk examining my Mexican Olive. It was too late to change my story so I just kept layering it on. Thank goodness there was no such thing as Google back then. I would have been ferreted out quickly. Today you can ask Mr. Google just about anything and get an instant answer—sometimes it’s even right! In fact, I just Googled Mexican Olive and up came the Mexican Olive ornamental flowering tree, and a beautiful Mexican Olive seashell. I guess I could have built a case around the fact that the flower tree sometimes would develop fruit as do those in the Mediterranean region. If you think fast enough and talk fast enough anything is possible.